"So into London by water; and in Fish-Streete my wife and I bought a bit of salmon of 8d. and went to the Sun tavern and eat it, where I did promise to give her all that I have in the world but my books, in case I should die at sea." (Samuel Pepys' diary, 15 March 1660 - he was about to sail to Holland to bring back Charles II for the latter's restoration to the throne). This based on what used to be a signature dish (in the days when salmon was not farmed and was an expensive luxury) of the restaurant of the Frères Troisgros at Roanne – one of France’s great restaurants. Put the wine, vermouth, fish stock and shallots into a saucepan and reduce to a few spoonfuls of syrupy liquid. Add the cream and reduce again slightly. Add the chopped sorrel, salt and pepper and cook for another few minutes until the sorrel has collapsed and lost its colour. Reserve while you gently fry the salmon (seasoned with salt and pepper) in one tablespoon of the butter until just cooked. Reheat the sauce, stir in the remaining 2 tablespoons butter (cut into small pieces), and pour over the salmon. These are rather crumbly fishcakes. An egg or egg white can be added to bind them. Mash together the potato, melted butter, salt, fennel seeds, green peppercorns, parsley and the juice and zest of the half lemon. Flake the salmon and mix it in gently. Chill the mixture in the fridge for at least half an hour to firm it up. Using well-floured hands, form the mixture into about six flattish fishcakes. Fry them gently in the oil on both sides for 2-3 minutes, until golden. A good dinner party dish as it can be prepared in advance up until the stage where you add the fish. Soften the onion in some oil, without letting it colour. Add the chilli, garlic, ginger and cumin and cook for another minute or so. Add the coconut milk, sugar and salt and simmer for 15 minutes. Let it cool a little. Then put in a blender with the coriander and parsley and blend until smooth. Reheat to simmering in a saucepan and add the salmon chunks. Turn off the heat and leave them to cook for 5-10 minutes in the residual heat (they are cooked when they will flake when prodded). Serve with rice. 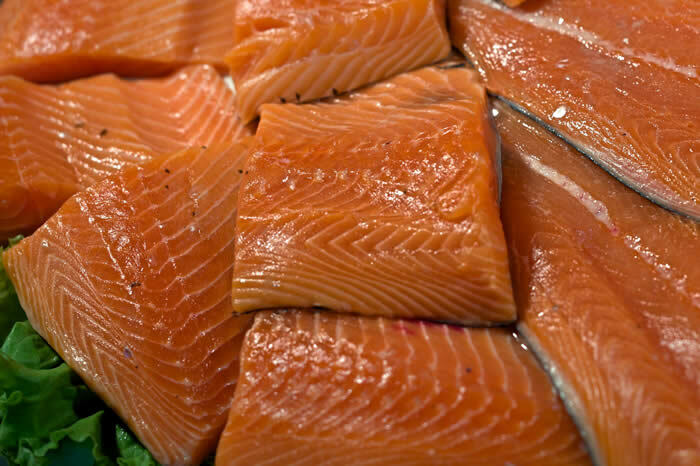 Poach the salmon until just cooked (put it in a pan of cold salted water; heat it very slowly to the stage when a scum is beginning to form on the surface of the water; turn off the heat and leave it in the hot water for at least half an hour). Cut the aubergines into four lengthwise and arrange on a baking-sheet cut sides uppermost. Anoint with oil and bake in an oven pre-heated to 220C/ gas for 15-20 minutes or until the flesh of the aubergine is soft. Leave to cool a little and peel off the skin. Cut the flesh into bite-sized chunks. Cook the chilli and lime zest for couple of minutes in some oil. Turn off the heat and add one tablespoon of Thai fish sauce, the lime juice, sugar and garlic squeezed through a garlic squeezer. Flake the salmon and combine with the aubergine pieces. Add salt and pepper to taste (not too much salt, as the fish sauce is salty). Sprinkle chopped mint or coriander over the top. Serve lukewarm or cold with good bread or some rice. This sauce, which comes from France, is also good with other grilled fish, including mackerel. Melt the shallots in the butter without colouring. Add all the other sauce ingredients except the mustard and cook for 2-3 minutes. Stir in the mustard and serve beside the grilled trout. This is a classic French recipe. The version below differs from the usual in that the trout are grilled rather than fried, and then skinned for a luxury touch. The skin has to be removed just before serving, which is a tiny bit fiddly, so it is best as a dish for no more than two people. Toast the almonds so that they are lightly browned (this is best done in an empty saucepan or frying-pan, shaking frequently so that they do not burn) and put them on a plate to one side. Grill the trout on both sides on a rack without any oil or butter – they are done when the skin starts blistering brown and black. While they are grilling, melt the butter in a frying-pan and cook until it is just beginning to go brown – what the French call noisette or hazelnut coloured. Add the almonds, lemon juice, salt and pepper, and keep warm. Now remove the skin from the grilled trout – it should be quite thick and hard and will come away easily. Arrange the skinned trout on pre-heated plates and pour the butter-almond-lemon mixture over the top. Serve with new potatoes and a sprinkling of parsley. Fry the eel briefly in the butter or oil, until it stiffens. Add the sorrel and spinach and cook stirring until they melt. Add the celery, herbs and other greenery, and the wine and simmer covered for 15-20 minutes. Put 1 tsp cornflour in a small basin and gradually stir in a tablespoon or two of cold water and then the cream. Stir this mixture into the eel and add salt, pepper and lemon juice to taste. Cook stirring for another minute or so until it slightly thickens. Serve with fried bread and/or boiled potatoes. "All day at home looking upon my workmen, only at noon Mr. Moore came and brought me some things to sign for the Privy Seal and dined with me. 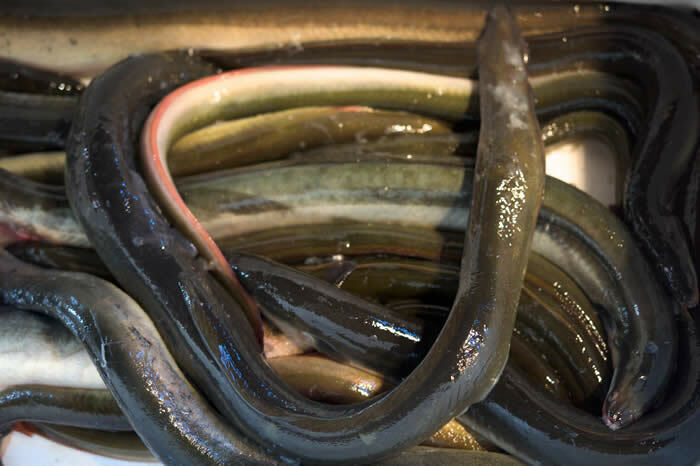 We had three eels that my wife and I bought this morning of a man, that cried them about, for our dinner, and that was all I did to-day." From Samuel Pepys' Diary, 15 December 1660.